References: Augsburg, from 'Force d'Europe'. Plan of Marienburg (Malbork). 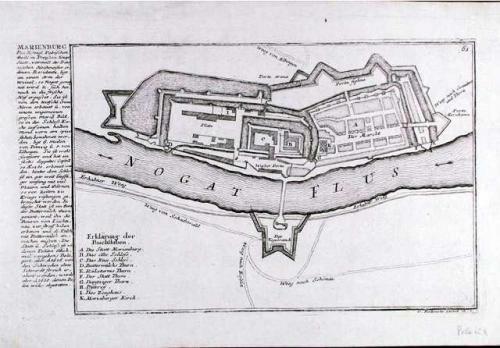 The fortifications were started in the 1274 by the Knights of the Teutonic Order (The Hospital of St. Mary of the Germans in Jerusalem) who were invited to Poland to help subdue the pagan Prussians. In 1309 it became the Capital of the Order. A unique triple line of fortifications made this stronghold impregnable. A description has been engraved to the left of the image.